Calculator Ruler 7 hole thats easy, fast and light -- the answer's at your fingertips. Discover just how easy it is to: add, subtract, multiply and divide and calculate sophisticated formulas with ease. Common formulas are also conveniently written on the back side of the calculator. 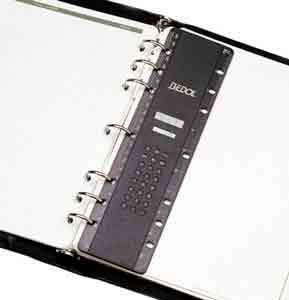 Just snap this powerful beauty in almost any binder or organizer that has 3 or 7 holes. Fits Day Runner, Day-Timer, Franklin and most other organizers that are approximately 10.5 inches high. Also fits most any standard 3 hole binder.